We just received a shipment of Alhambra 2nds. From time to time the Alhambra U.S. distributor contacts us with a list of guitars that don’t meet their strict quality control standards. Some have minor cosmetic flaws, some have finish cracks or other minor issues, some we can find nothing wrong at all. 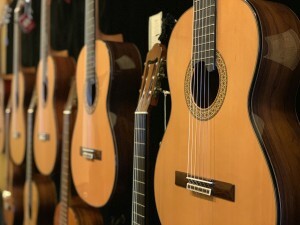 We have a great assortment of these guitars including some models not usually sold in the U.S. These include some higher end models: a model 10 Premier, two Linea Professionals, a Premier Pro Exotica, a 7P and a 7c. There are also some great values on less expensive models such as the 1-OP Cutaway with Fishman pickup, a cool sounding 2F and a Pedro Toledo model 4 with a side sound port. Come on in and check them out. These usually don’t last long. Copyright © 2014 Rosewood Guitar.